Below we are posting two articles. The first is written by written by Chris Bambery of Counterfire, and a supporter of RISE, assessing the current situation in Catalunya. The second is written by Sean Bell for Common Space. Attempts to sabotage and prevent the upcoming referendum in Catalonia carry echoes of Spain’s Francoist past. On Sunday the Spanish interior ministry announced that the paramilitary Guardia Civil had seized more than a million posters and pamphlets urging people to vote Yes to Catalan independence, in a raid on a warehouse near Barcelona. It was the latest in a sustained campaign by the Spanish state to stop or sabotage a referendum on independence to be held in 1 October, as agreed by the autonomous Parliament of Catalonia. Spain’s Constitutional Court has ruled the ballot illegal on the basis it defies the nation’s constitution which decrees that Spain is indivisible. *The Spanish Public Prosecutor has ordered the Catalan Police to seize all ballot papers for the referendum. * The Director of the TV3 Catalan language TV station has been threatened with criminal charges if it broadcasts information on the referendum. * Spain is to prosecute more than 700 Catalan mayors for permitting preparations for voting to proceed. * A Catalan language newspaper editor was arrested and charged with assisting the referendum process after the Guardia Civil raided his office. * The Catalan referendum website has been taken down by the Spanish state. * Spanish postal staff have been warned not to distribute referendum material. * Spain has threatened to cut off electricity to Catalan referendum polling stations. * A public meeting discussing Catalan independence to be held in Madrid has been banned. The Spanish King, Felipe V, and the Prime Minister, Rajoy, have called on Catalans not to vote in the referendum. As I write we await the outcome of the Rajoy Government’s threat to take over Catalonia’s finances, which would end funding for the referendum. In the final two weeks before the referendum is due to happen further action is likely from Madrid. It all acts as a reminder of how much the ruling Popular Party is rooted in the politics of the Franco dictatorship which ruled Spain from the end of the Spanish Civil War in 1939 until the dictator’s death in 1975. While it is not fascist itself it is dominated by the grand children of loyal Francoists and shares the dictatorship’s belief that Spain must remain united at all costs. That is a Spain dominated by the main region, Castile, centred on Madrid. The Spanish state itself suffers from a democratic deficit which takes the form of institutionalised corruption, rooted in the years of Franco’s regime, human rights abuses, including torture, rooted in the long running conflict in the Basque Country (where the Rajoy Government refuses to conclude a peace process with ETA, the nationalist guerrilla group, even though it has declared a permanent cease fire and disarmed) and a refusal to deal with the legacy of the Spanish Civil War, and in so doing recognise the suffering of the losing, Republican side. Catalans point to the huge infrastructure projects lavished on Madrid and the failure to invest in Catalonia, which pays the biggest proportion of any region in taxes to the Spanish government. They can also point to the fact there has been no Catalan prime minister of Spain, except under the brief First Republic of the 1870s overthrown by a military coup. The scars of Franco’s rule are still felt there, too, a time when the use of Catalan in public was banned along with Catalan Christian names, Catalan books and newspapers. Yet until relatively recently support for independence was a minority sport. What helped change that was the decision of the Constitutional Court in 2010 to strike out crucial sections of the new Catalan Statute of Autonomy provoked a huge demonstration of one million people in Barcelona, under the slogan “We are a nation – We decide.” It was followed by a series of local referendums which voted in favour of independence. This all coincided with the imposition of severe austerity measures following the 2008 financial crash. Before 2010 support for independence was limited and every sign showed that the majority of Catalans would have been content if promises made of greater autonomy had been delivered upon. Those promises, made in 2005 by a Socialist led government, were watered down in the Spanish Parliament before being finally presented for a vote in a Catalan wide referendum. Then the Constitutional Court intervened after cases had been brought to it by the Popular Party. Growing numbers of Catalans drew the conclusion that the Spanish state would never grant full autonomy and that it took Catalan money in taxes but did not match that by investment in infrastructure. Support for independence mushroomed. But what is happening now in Catalonia is that by cracking down in its attempts to stop the referendum, the Spanish Government is alienating many who, while they don’t support independence, do believe the Catalan people have a right to decide. Many of the mayors facing prosecution are Socialist Party supporters who oppose independence. Unfortunately, in Spain, the left has, in general, taken a bad position on supporting Catalan self-determination. Too many shelter behind a position of “a plague on all nationalisms,” ignoring the fact that Spanish nationalism is the nationalism of an imperialist state, and one linked to the denial of democratic rights to the people of Catalonia and the Basque Country. Fortunately the radical left Podemos, while opposing independence, has at least defended the right of Catalans to vote in a referendum. What is happening in Spain at present is very serious. You only have to imagine that if this was occurring in Russia or Iran the howls of indignation there would be from the Western media and politicians. In this situation it is imperative that voices supporting Catalonia’s right to self determination and denouncing the actions of the Spanish state are heard loud and clear. 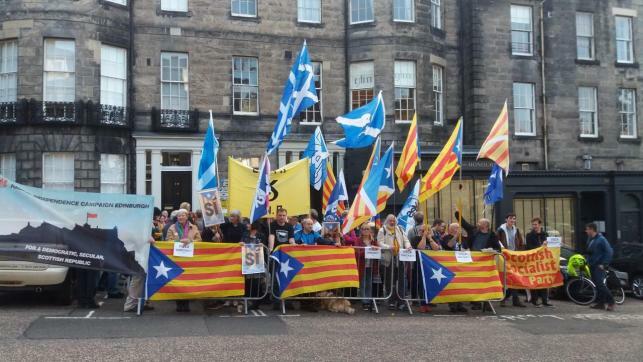 Emergency demonstrations in support of the Catalan referendum have been held in Edinburgh, where protestors assembled outside the Spanish consulate, and Glasgow, while Dundee’s new festival of political radicalism Leftfest hosted its own expression of solidarity with Catalonia. Connor Beaton, one of Leftfest’s organisers and national secretary of the Scottish Socialist Party, commented that Catalonia’s repression at the hands of the Spanish state evoked “uncomfortable memories of Franco’s dictatorship”. No Scottish Conservative politicians signed the letter. Neither did the two contenders for the Scottish Labour leadership, Anas Sarwar and Richard Leonard, who have remained silent on the issue. The letter continues: “We come from a range of political traditions, with differing views on Scotland’s constitutional future and a collective neutrality on the question being posed to the Catalan people but we are united in our belief in democracy. “The Spanish Government claim to be acting in defence of democracy but threats of legal action against hundreds of democratically elected representatives and repressive acts against an elected government, media organisations and citizens are in no way democratic acts. “The recent arrest of a Catalan government minister and a number of government staff was a particular violation of the norms of European democracy. “The situation in Catalonia is a political challenge and it can only be adequately resolved through political action, through dialogue and through allowing the people to express their will democratically. “Legal action against the Catalan government, several hundred local mayors and others perceived to be facilitating the referendum is no way for a democratic European state to act against its own people. Commenting on the escalating situation in Catalonia, Ross Greer MSP, the Scottish Greens’ external affairs spokesperson, said: “As MSPs we represent a spectrum of opinions on Scotland’s own constitutional debate and it’s certainly not for us to tell the Catalan people what choices they should make. “As democrats and parliamentarians however, we must defend the right of peoples across the world to decide their own future and the right of elected representatives to carry out their duties to the people without feat of arrest. “To see a state at the heart of Europe take such oppressive actions against its own people is simply unacceptable. The UK and Spain may be different places with different constitutional traditions but in Scotland we have proven that such significant questions can be answered through peaceful debate and dialogue. The Spanish Government has pledged to do everything necessary to prevent the referendum, which has been deemed illegal by Spain’s Constitutional Court. According to Spanish newspaper El Nacional, Spain’s Guardia Civil have entered 31 Catalan council offices to seize literature relating to the referendum, as well as documents and emails signed by Catalan mayors allowing the buildings to be used as polling stations. As the Guardia Civil raided the Catalan Department of Economy building, an estimated 40,000 people rallied outside in protest against the actions of the Spanish authorities. 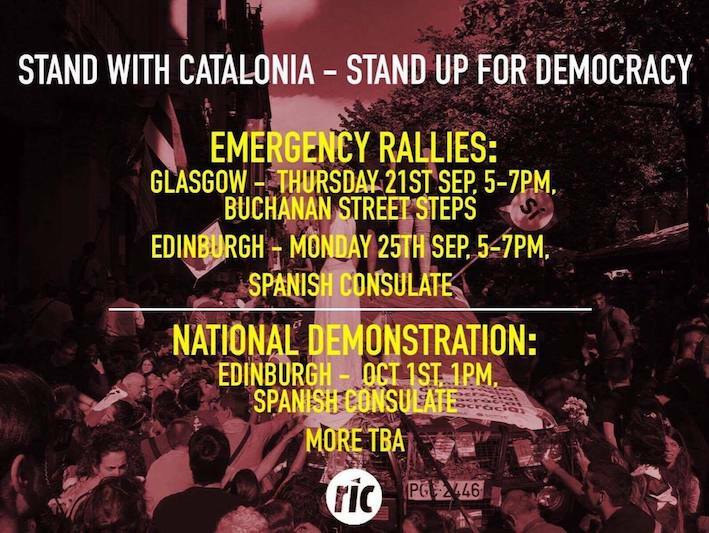 On 1 October, the planned date of the independence referendum, a national solidarity demonstration organised by the Radical Independence Campaign will take place in Edinburgh outside the Spanish consulate on North Castle Street at 1pm.